For more than 20 years Scott was a docent at Big Basin where his knowledge of redwood flora and fauna was legendary. 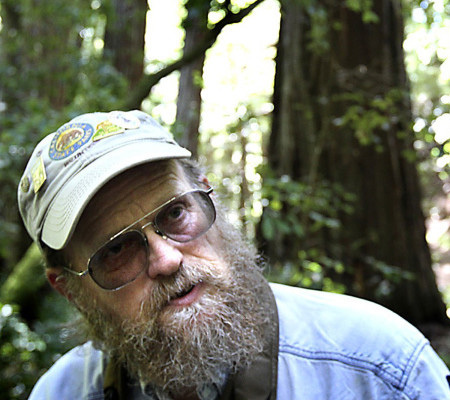 In fact, the Santa Cruz Sentinel newspaper once referred to him as a “walking wildlife encyclopedia”. He loved redwoods and Big Basin and shared his love and knowledge with thousands of park visitors over the years. He was always curious to learn more. When Zane Moore, a college student and young botanist, began a project to locate and identify the biggest and tallest redwoods in the Santa Cruz Mountains, Scott was right there to help him with the field work. Scott was so special that after he passed on in December of 2017, two old-growth redwood trees were permanently named in his honor. The first named tree is near the old Lodge in Big Basin, while the second tree, which Scott helped to measure when he was still alive, is in a more remote area. This tree is in many ways a more fitting memorial. Scott stood tall amongst his fellow mortals, and this tree is the tallest tree in the Santa Cruz Mountains at 352 feet tall. Scott was also big-hearted, and this tree is big, with a 12-foot diameter. Scott was senior to the other docents, and the Scott Peden tree, at 1,388 years old, is senior to most other redwoods, growing stronger and taller each year. Like this tree, Scott had a strength of spirit and a wisdom that made him too a giant of the forest. He will be missed. Follow this link to learn more about redwoods.